contributors winter 2013/2014 corporate writers JENNIFER BLECHER D ON DEAMICIS ROBERT DWYER CAROLYN S. ELLIS CAROLYN S. ELLIS LESLYE FLIGOR CHERYL FENTON PAMELA FOX RUTH FURMAN PAT GOWDY CALVIN HENNICK JOE MAYHER BETSY LAWSON CAROL OT T KERI LYMAN JANET SEIDL STEVE MAAS PETER BAKER creative director ADAM CLUFF B OB DAMON JILL NILSEN editor D ODIE BUMP PAT TY LENZ B OVIE BETH FURMAN publisher editorial board GINA WICKWIRE DAVID WETHERBEE general manager art and production TROY SANTI senior art director SHARON PECK production director JANET MENDELSOHN photographers advertising sales (781.235.6980) ALLISON IJAMS SARGENT PETER BAKER CHERYL B. SCAPARROT TA HELAINE BLO CK account manager n Peter Baker Studios 203.259.4566 www.pbaker photo.com NAZ SIOSHANSI DIANE BRANNIGAN account manager LIZ SUNEBY STUART C. DALE account manager ERIC BARRY n Eric Barr y Photography 617.733.7444 www.er icbar r y photog r aphy.com DIANE SPEARE TRIANT BETH FURMAN CAROL SAMOST account manager copy editors and proofreaders MARTHA PRO CTOR 781.424.2118 www.wellesleywestonmagazine.com MAURA WAYMAN n Maur a Way man Photog r aphy LAUREN WETHERBEE WellesleyWeston Magazine is published quarterly by Elm Bank Media, LLC, 5 Vane St., Wellesley, MA, 02482. WellesleyWeston Magazine is printed in the United States of America. ©Copyright 2013, Elm Bank Media, LLC. All rights reserved. No part of this periodical may be reproduced by any means, prints, electronic, or any other, without prior written permission of the publisher. 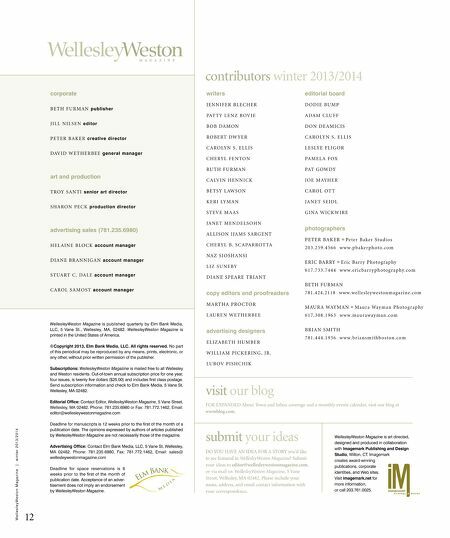 Subscriptions: WellesleyWeston Magazine is mailed free to all Wellesley and Weston residents. Out-of-town annual subscription price for one year, four issues, is twenty five dollars ($25.00) and includes first class postage. Send subscription information and check to Elm Bank Media, 5 Vane St, Wellesley, MA 02482. We l l e s l e y We s t o n M a g a z i n e | w i n t e r 2 0 1 3 / 2 0 1 4 Editorial Office: Contact Editor, WellesleyWeston Magazine, 5 Vane Street, Wellesley, MA 02482. Phone: 781.235.6980 or Fax: 781.772.1462, Email: editor@wellesleywestonmagazine.com Deadline for manuscripts is 12 weeks prior to the first of the month of a publication date. The opinions expressed by authors of articles published by WellesleyWeston Magazine are not necessarily those of the magazine. Advertising Office: Contact Elm Bank Media, LLC, 5 Vane St, Wellesley, MA 02482. Phone: 781.235.6980, Fax: 781.772.1462, Email: sales@ wellesleywestonmagazine.com Deadline for space reservations is 6 weeks prior to the first of the month of publication date. 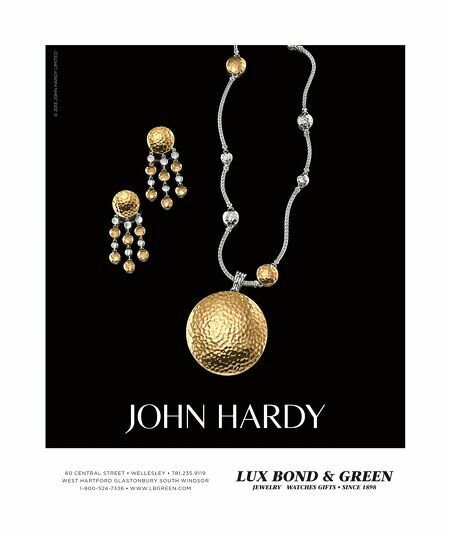 Acceptance of an advertisement does not imply an endorsement by WellesleyWeston Magazine. 12 ank mB El m ed ia 617.308.1963 www.maur away man.com advertising designers BRIAN SMITH ELIZABETH HUMBER 781.444.1936 www.br iansmithboston.com WILLIAM PICKERING, JR. LUB OV PISHCHIK visit our blog FOR EXPANDED About Town and Inbox coverage and a monthly events calendar, visit our blog at wwmblog.com. submit your ideas DO YOU HAVE AN IDEA FOR A STORY you'd like to see featured in WellesleyWeston Magazine? Submit your ideas to editor@wellesleywestonmagazine.com, or via mail to: WellesleyWeston Magazine, 5 Vane Street, Wellesley, MA 02482. Please include your name, address, and email contact information with your correspondence. WellesleyWeston Magazine is art directed, designed and produced in collaboration with Imagemark Publishing and Design Studio, Wilton, CT. Imagemark creates award-winning publications, corporate identities, and Web sites. Visit imagemark.net for more information, or call 203.761.0025.